It sometimes works for the fashion industry  bring back an old fashion, make it new and a fad is born. This time, though, it's the automotive industry, hoping for the kind of lifestyle change that can bring car sales back from the dead. All three major U.S. auto companies have been working on plans for electric cars, and debuted some prototypes at the North American International Auto Show in Detroit this week. Ford announced that it hopes to have an all-electric vehicle, which would be able run for 100 miles on a single charge, on sale by 2011. Chastened by their collapsing sales and sustained by infusions of bailout cash, GM, Chrysler and Ford need to come up with ways to revolutionize car design, clean up the environment and wean the industry off foreign oil. The concept of all-electric cars has faced some resistance, but the big three seem readier than ever for change  and the idea, it turns out, isn't as radical as one might think. There was indeed a time when electric cars were useful and relatively popular. Back when cars were used mostly for short jaunts around town or for deliveries between two nearby points, the charging of an electric car posed very little problem. In the 1830s, when Dutch inventor Sibrandus Stratingh created an electromagnetic cart, the vehicles have always stood out as a cleaner, cost-effective option to the steam or internal combustion engine. From Stratingh's invention evolved actual cars in the late 1800s that could move at low speeds using rechargeable batteries. Quieter and less noxious than their gas-powered counterparts, these electric cars surpassed them in popularity in the early part of the 20th century. One of the best-selling vehicles of that time was the Columbia Runabout, which could go 40 miles on a single charge and run at speeds up to 15 m.p.h. Later incarnations of the electric car, such as the Detroit Electric, were more attractive than gas-powered versions because they didn't backfire. Before her husband Henry's mass production of gas-powered cars crushed the electric industry, Clara Ford drove a 1914 Detroit Electric, which could last 80 miles without a charge. The electric-car industry peetered out during the Roaring 20s when owning a car became more of a convenience and less of a luxury. Rising fuel costs and the fear of exhausting fuel supplies gave rise to various electric vehicle prototypes in the 1960s and 1970s such as the Vanguard-Sebring CitiCar, which was a boxy, even more miniature version of its miniscule Indian predecessor, the REVA, one of the world's best-selling electric cars. One of the most important changes those cars exhibited was a reliance on fuel cells, which produce electricity from some form of fuel (hydrogen, hydrocarbons and alcohol have all been used) as an alternative to batteries. While this helped increase speeds, it didn't help sales take off and ultimately defeated the purpose of a more environmentally friendly, non-fuel reliant automobile. Better versions of electric cars arrived over the next two decades. 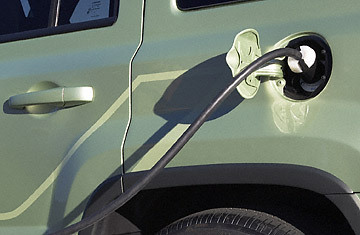 GM's EV1 made it to production but proved too expensive to make in mass quantities; Toyota's Rav4 EV, which debuted in 2001, required a separate wall mount for charging. The Tesla Roadster, which first hit the streets in 2006, boasted a sticker price starting at $90,000 each  well out of reach for most consumers. The latest entry, the Chevy Volt, is expected to be released by 2011; however, the Volt is actually a plug-in hybrid with a gas-powered engine that kicks in as a generator to recharge the car's batteries. The future of electric cars, it seems, relies not only on whether their purchase and use will catch on, but also on how good the car batteries can become: how much power they can hold, and for how long, has long been the technology's main stumbling point. GM's plans to build a lithium-ion battery plant in Michigan to assemble battery packs could presage a new technology race among the big three and companies in nations like India and China to see who can first build the battery that will make affordable, long-driving electric cars a reality.